Three months after the general election of 4 March, Italy has a government again. On June 1, the yellow-green government, was officially given birth to by the lawyer Giuseppe Conte and the two vice-premiers – the political head of the Five Star Movement (M5S) Luigi di Maio and the secretary of La Lega, Matteo Salvini. The vote of confidence in the new executive should take place in the next few days in the Senate and in the Chamber of Deputies. It is, with a few exceptions, the same government that was rejected last week by the president of the republic, Sergio Mattarella. The refusal of the president to appoint Paolo Savona as finance minister was side-stepped by Savona who accepted being in the government as a minister without portfolio but with a mandate for local government issues. The delicate position of finance minister will be taken by Professor Giovanni Tria, a Eurosceptic, very close to the Lega and appointed on the advice of the same Savona. It was the proposal last week to appoint Savona to the finance ministry that provoked a chorus of disapproval from European chancelleries and a certain panic on international markets. Mattarella, under the pressure of these same markets to take a ‘responsible’ approach, had made extensive use of his presidential prerogatives to block the emergence of a government perceived, wrongly or rightly, as fundamentally Eurosceptic. Paolo Savona, now the Minister for Relations with the EU, provoked the concern of European finance ministries, stock exchanges and rating agencies as someone capable of sending the EU to the devil. Paolo Savona is eighty-two and someone who has a long political career behind him as a representative of the establishment and of the big banks. He was a minister in the Ciampi government, a manager in the BNL, founder of the Confindustria’s private university, Luiss etc. In short, a man totally of the establishment and the big Italian bourgeois but still seen as capable of turning against the European Union and the Euro itself under pressure. The controversy over Savona overseeing the economy indicates the concerns and fears about the possibility that an “imaginative” economic policy could push Italy out of the single currency within a few weeks. Mattarella’s outrageous intervention expressed the depth of fear and nervousness about the future on the part of many within the Italian as well as the European ruling class. There is a power struggle amongst the representatives of Italian capitalism. One sector produces essentially for the domestic market and feels crushed by globalisation, wanting to break free from the restrictions of Brussels. On the other hand are the large export companies that are linked to international capital and therefore look for a greater integration of national economies. 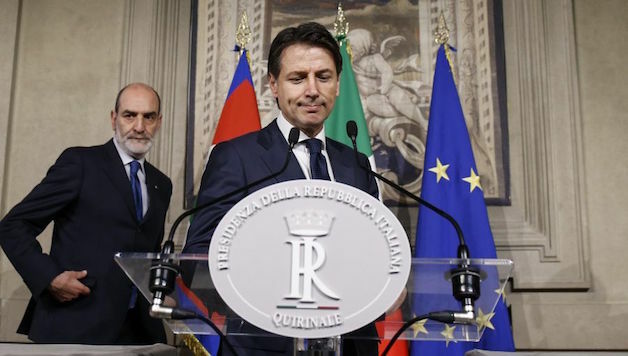 The president intervened on behalf of Italy’s establishment who had been clearly rejected in the polls as expressed in the more than 50% of voters supporting the Lega and the M5S and in the electoral punishment of the Democratic Party (PD) and the Forza Italia. The very suggestion of Savona as finance minister opened up a wasps’ nest of controversy which speaks volumes about the state of health of the economy and of the country’s credit system. Italy is plagued with enormous economic problems – one of the highest public debts in the world, anaemic growth, 11% unemployment and a rotten and deeply unstable banking system. In this state, it threatens the entire single currency and the economy of the old continent. The new government under Giuseppe Conte will in reality be directed by two consuls – Salvini the Lega’s leader and Di Maio of the M5S – to implement key parts of their electoral programme. Di Maio as Labour Minister is intent on carrying through measures to supplement the lowest incomes, if not the whole ‘citizens’ income’ plan. Salvini takes on the Interior Ministry declaring: “The honeymoon is over for illegal immigrants”. One day after this inflammatory racist declaration, a Malian agricultural labourer and USB trade unionist, Sacko Soumayla, was killed – shot in the face while collecting planks to build a makeshift home in the shanty-town where he lived. This is an indication of the climate that exists in the country. Matteo Salvini has declared that the campaign policy of repatriating all undocumented immigrants – up to 500,000 people – will be adhered to. He is by no means the only minister in the Conte government to have positions markedly on the right. The new Families Minister, Veronese, is a Catholic extremist lawyer in the Lega. He believes, for example, that homosexuality represents a danger for society and has clearly sexist and anti-abortionist positions. The “Government of Change” can also boast the lawyer, Buongiorno – formerly confidante and lawyer of right wing prime minister, Giulio Andreotti – as Minister of Public Administration. Moavero Milanesi, a former minister in the Monti and Letta governments, and a long-time European official, will go to the foreign ministry. His colleague at the Ministry of Education, Universities and Research will be Marco Bussetti, a former physical education teacher in a private school. At the ministry of the environment will be a general of the Carabinieri police corps, Sergio Costa. In short, the new ‘face of change’ will be a government clearly positioned on the right with some technical figures to ensure “the good name of the institutions” – but also some fascist leaguers and faces from the old, post-war First Republic. It will not bring stability. Given the huge vote in March against Italy’s establishment and for populist parties, a government of this type will inevitably enter into collision with workers and young people. The repressive wave that will hit activists, workplace union delegates, immigrants and women will generate a powerful reaction from people. The initial absence of a valid and credible class opposition to this government will underline in the eyes of millions of Italians the need to build a new workers’ party to respond to all the attacks. Resistenze Internazionali will be at the forefront of the construction of such a party.